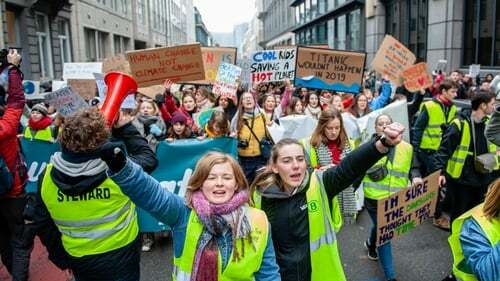 Thousands of Belgian schoolchildren skipped classes today to flood Brussels in an unprecedented protest against global warming and pollution, vowing to miss school once a week until the government takes action. "If we skip every Thursday, if we don't go to school, the big people in our country and in the world will see that this is a problem," said high school student Joppe Mathys. Another student held a sign saying: "Be part of the solution, not the pollution." "Dinosaurs thought they had time too," read one banner. Broad protests started across Belgium on 2 December with a "Claim the Climate" march, when over 65,000 demonstrators called for Belgian and European leaders to adopt ambitious climate policies in line with goals set by the Paris Agreement in 2015. That demonstration came before the COP24 UN climate summit in Poland, where a report was released ranking Belgium 31 out of 60 on the 2019 Climate Change Performance Index, or a "medium" performance in implementing the Paris Agreement. Brussels has been regularly ranked as one of the most congested cities in western Europe in recent years due to Belgium's high population density and large number of commuters. Across the EU, road congestion costs the bloc 1% of its annual economic output, or €100bn a year, according to the European Commission.